﻿ Endocrine imaging: What roles do PET and PET-CT play? 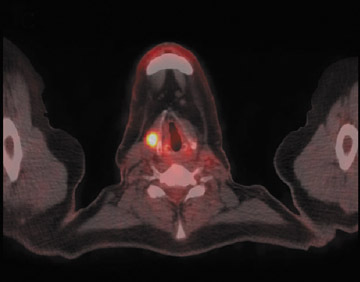 Endocrine imaging: What roles do PET and PET-CT play? Dr. MacFall recently completed medical school and will begin his Radiology Residency at the Medical University of South Carolina in July 2008. Dr. Gordon is a Professor of Radiology and Nuclear Medicine and Dr. Davis is a Resident in Nuclear Medicine, Medical University of South Carolina, Charleston, SC. 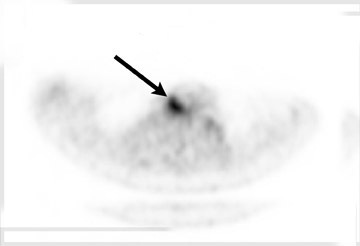 Positron emission tomography (PET) is a form of functional imaging and is now widely used to assess metabolism in neoplasia. The most routinely used radiotracer in PET imaging today, 2-[18F] &#64258;uoro-2-deoxyglucose (18F-FDG), has a short half-life of 110 minutes. It is known that glucose uptake by cancer cells is increased because of the increased production of glucose transporters that incorporate into the cell membrane. 1 18F-FDG crosses the cell membrane and is phosphorylated to become FDG-6-phosphate, a compound that is resistant to further metabolic processes. 2 When its kinetic energy is dispersed as a positron, the positron travels a short distance and interacts with an electron. These 2 particles then undergo an annihilation reaction. Their rest mass is converted into two 511-keV photons that are emitted approximately 180¢ª apart. If the 2 photons are detected at the same time by a pair of detectors located on opposite sides of the patient, they are considered in coincidence, and the annihilation event can be localized along a straight line joining the coincidence detectors. 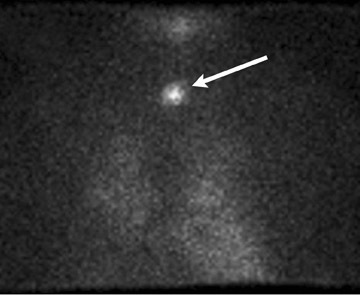 Mathematical reconstruction methods, corrected for photon attenuation and scatter, can estimate the location and can semiquantify the amount of positron-emitting radionuclides within a patient. 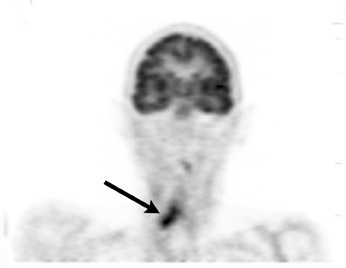 Positron emission tomographic images are acquired almost simultaneously with computed tomographic (CT) images. Fusion of these data sets is accomplished by complex computer algorithms immediately after acquisition. Fused PET/CT imaging continues to advance in the detection of smaller-sized tumors and has established itself as a valuable dual-modality approach that successfully integrates anatomy and physiology for improved efficiency and accuracy in the oncologic and nuclear medicine specialties. 3,4 Fused images provide improved anatomic detail and allow better localization of PET findings. Research with new PET radiotracers continues and will allow functional imaging with PET to advance the fields of nuclear medicine and molecular imaging at unprecedented rates in the upcoming decades. The role of functional imaging for endocrine abnormalities has increased over the last few decades. Endocrine tumors can be overlooked on conventional anatomic imaging because of a tumor¡¯s small size as well as limited or equivocal clinical data. It can also be difficult for conventional imaging to differentiate disease recurrence from post surgical changes. Furthermore, anatomic imaging does not provide information on tumor activity. Endocrine malignancies are uncommon, comprising 1% to 2% of all tumors affecting adults, and 4% to 5% of tumors affecting children. Some endo crine tumors are functional and secrete active substances that trigger physiological symptoms that prompt patient presentation. A smaller fraction of patients with endocrine neoplasms present with symptoms associated with mass effects that are more typically seen in patients with large nonfunctional tumors, which are commonly detected incidentally (ie, the ¡°incidentaloma¡±). The increasing use of whole-body multidetector CT (MDCT) scans has led to an appreciable rise in the identification of such tumors. Thyroid nodules are extremely common among the adult population, ranging from 4% to 7% within the whole population and a female-to-male ratio of 4:1. 5 The occurrence of malignancy in these nodules is fairly rare; however, correctly categorizing identified nodules is critical for management decisions. 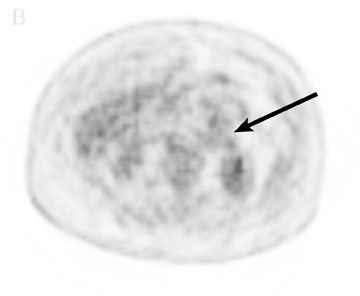 Current strategies for characterizing these nodules include nuclear thyroid scintigraphy as well as thyroid ultrasound. Iodine-123 (I-123) scintigraphy allows functional analysis of nodules and classification of ¡°hot¡± versus ¡°cold¡± nodules. These terms describe uptake of radiotracer by the nodule and the surrounding thyroid gland. ¡°Hot¡± nodules, which display high uptake of I-123, are rarely malignant, while ¡°cold¡± nodules, which display low uptake levels, can be malignant in 5% to 10% of cases. Cold nodules in patients who are younger can carry a malignancy rate of up to 35% to 40%. 6 This test does provide useful data but more commonly leads to further testing to delineate a more accurate diagnosis. Thyroid carcinomas are classified as either differentiated (ie, papillary or follicular) or undifferentiated (ie, ana plastic), depending on the histologic and cytopathologic findings. Typically, patients with papillary or follicular carcinomas receive iodine-131 (I-131) total body scans in their evaluation. 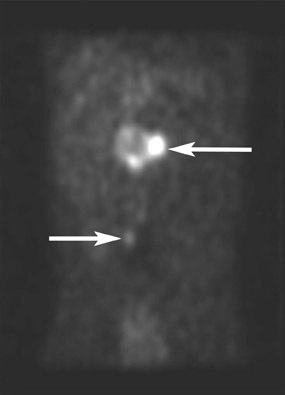 Figure 1 shows a patient who underwent total thyroidectomy for papillary thyroid cancer and was being evaluated for increasing thyroglobulin levels after surgery. 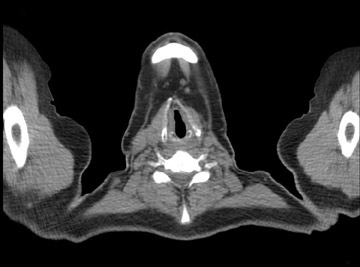 This patient had a positive I-131 scan, along with an 18F-FDG PET/CT scan that showed increased metabolic activity within the thyroid bed approximately 6 months after surgery. There have been numerous reports of patients with negative I-131 scans and positive 18F-FDG PET scans, and vice versa. 7-9 This ¡°&#64258;ip/&#64258;op¡± phenomenon, as it has been termed, was attributable to differentiation of the cancer. 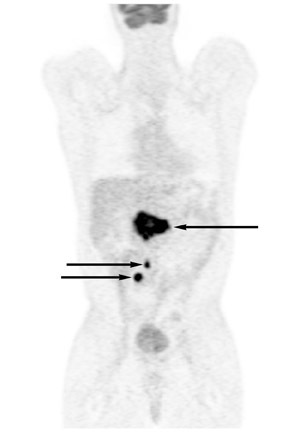 Figure 2 shows a patient who underwent an 18F-FDG PET/CT evaluation after a total thyroidectomy for biopsy-proven papillary thyroid cancer. This particular patient was treated with I-131 on 2 separate occasions and on follow-up 2 years later was noticed to have increasing thyroglobulin levels. He had an I-131 scan that was negative and was referred for 18F-FDG PET/CT evaluation for metastatic disease. The FDG studies showed a carcinoma. 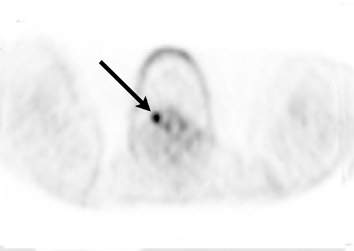 The advantage of 18F-FDG PET and PET/CT in thyroid cancer imaging can be further verified by reviewing data on patient management affected by 18F-FDG PET/CT results. 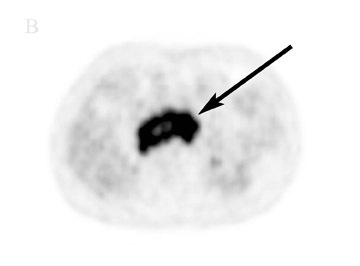 Frilling et al 13 found distant metastases using 18F-FDG PET (with CT comparison) in a number of their thyroid cancer patients who had prior negative I-131 scans, which led to alteration of the initial plan and management in some of their surgical cases. 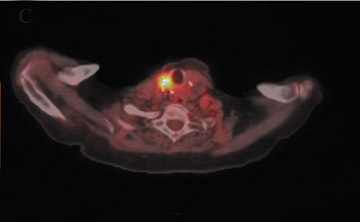 These distant metastases were identified on a 18F-FDG PET staging scan, which led to 3 patients being treated with curative intent using systemic agents instead of surgery for local recurrence. Likewise, Helal et al 14 showed a clinical change in 29 of the 37 patients who were positively identified with recurrent or metastatic disease using 18F-FDG PET. The study by Shammas et al 11 using 18F-FDG PET/CT showed a modification in the treatment of 44% of patients enrolled in the study. Most of these patients went on to have surgery for local recurrence or local metastatic disease in the neck. However, 3 of these patients were correctly diagnosed with distant metastatic disease (2 to the lung and 1 to the mediastinum), which led to nonsurgical intervention and the use of systemic therapy. Up to 79% of adrenocortical cancers produce some hormone or active agent that may lead to clinical symptoms. 15 Adrenal pheochromocytomas account for approximately 80% of catechola mine-secreting neoplasms and generally measure 4 to 5 cm at presentation. 16,17 Since functioning adrenocortical tumors can be elucidated using hormonal assays, it is the nonfunctioning tumors that require additional testing and imaging to determine management for optimal patient care. 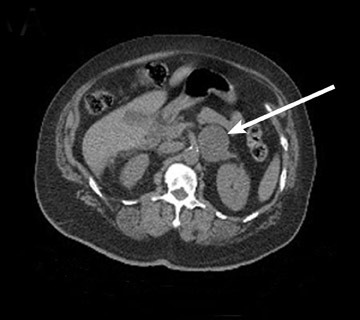 Imaging of patients with suspected pheochromocytomas usually begins with CT or magnetic resonance imaging (MRI) to assess the tumor. However, the variable appearance of pheochromocytomas on these modalities sometimes makes it quite difficult to establish an accurate diagnosis. 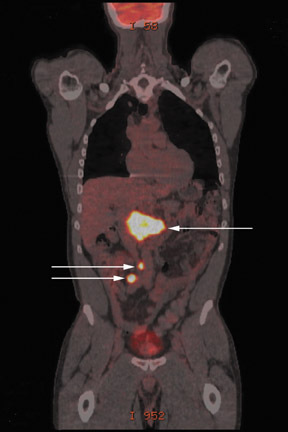 These tumors can range from solid to cystic, fatty to necrotic, and homogenous to heterogeneous. Functional imaging provides localization of the tumor to any part of the body, especially extra-adrenal sites or previously postsurgical areas that can have distorted anatomy. 18 Functional imaging with either I-123 metaiodobenzylguanidine (MIBG) scintigraphy or 18F-FDG PET/CT can prove useful for localization, although the anatomic correlation that CT fusion affords PET scanning is superior to that of MIBG alone. Studies have shown variable uptake of MIBG and 18F-FDG in pheochromocytomas. 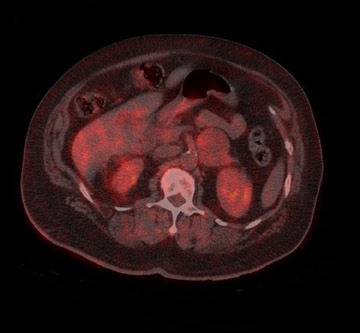 Some pheochromocytomas fail to accumulate MIBG but are able to accumulate increased 18F-FDG on PET/CT as well as pheochromocytomas that accumulate MIBG without increased metabolic activity seen on 18F-FDG PET/CT. 18-20 A study by Shulkin et al 19 showed that most malignant pheochromocytomas are better visualized with 18F-FDG, while more benign pheo chromocytomas are better detected with MIBG. 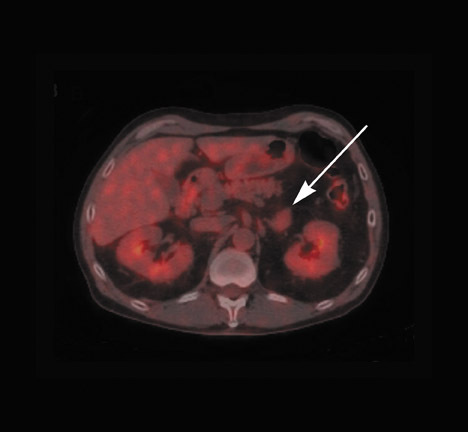 The patient shown in Figure 3 is a 72-year-old man who under went right adrenalectomy for a pheo chromocytoma that was diagnosed by elevated catecholamines and a positive MIBG scan. This patient then presented with a left adrenal mass that was positive for MIBG uptake. However, the left adrenal mass showed no increased metabolic activity on 18F-FDG PET/CT. 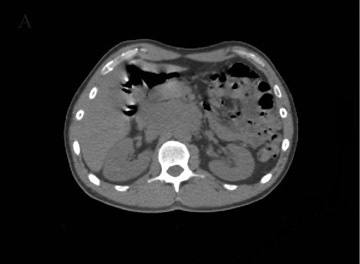 This patient is still undergoing a work-up for suspected left adrenal pheochromocytoma. 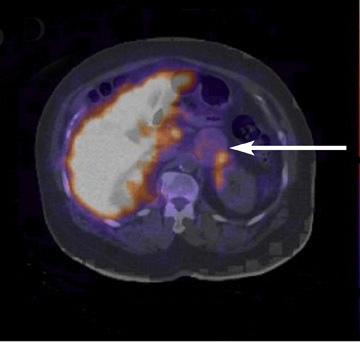 A recent study by Timmers et al 20 demonstrated the superiority of 18F-FDG PET/CT in detecting metastatic foci in patients with paragangliomas that have succinate dehydrongenase mutations. 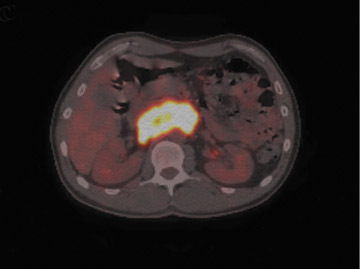 These authors concluded that 18F-FDG PET/CT should be the functional imaging study of choice for these types of paragangliomas, since some patients with metastatic lesions had falsely negative MIBG scans. Figure 4 shows a 48-year-old man with elevated catecholamines and metanephrines with uncontrolled hypertension. 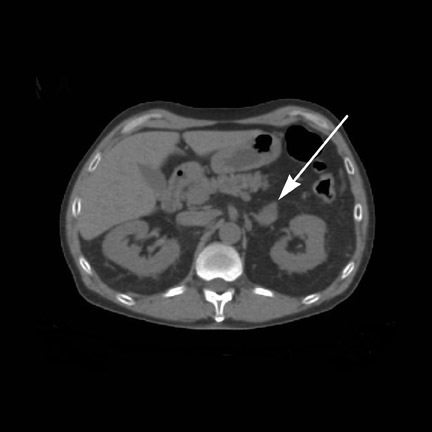 The patient was evaluated with an MIBG scan that showed increased uptake in his known left para-aortic extra-adrenal paraganglioma as well as another questionable site of second focus of disease. 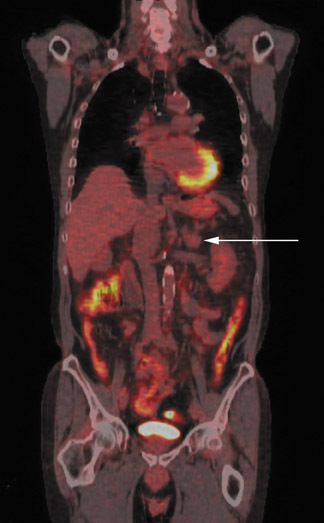 The patient¡¯s work-up was followed by 18F-FDG PET/CT, which showed hypermetabolic activity within the known paraganglioma as well as 2 additional foci that were lower in the abdomen, consistent with meta static paragangliomas. 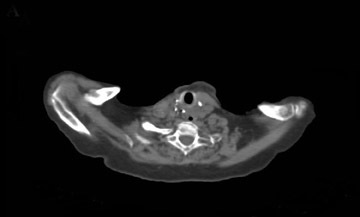 In this case, 18F-FDG PET/CT was shown to be more accurate in detecting this patient¡¯s metastatic paraganglioma sites. 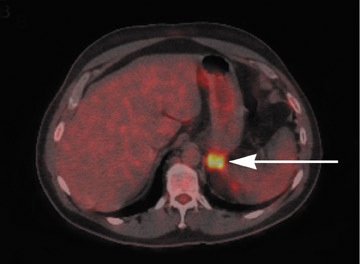 With the increased utilization of whole-body PET/CT scans for diagnosis and clinical staging in oncology, the incidence of unsuspected adrenal gland abnormalities is increasing. 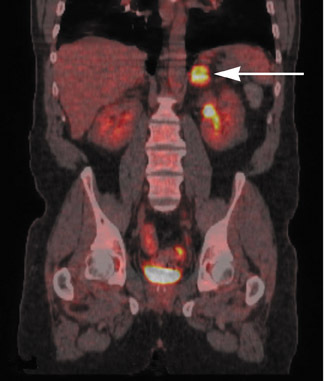 It has been reported that up to 1% of patients being evaluated with abdominal CT and as many as 2% to 5% of patients being scanned with contrast-enhanced CT have been found to have adrenal incidentalomas. 21,22 The majority of these incidentalomas are benign and do not produce any biologically active metabolites. Figure 5 shows a patient who underwent 18F-FDG PET/CT for the evaluation of an indeterminate left adrenal mass found on chest CT. Lack of hypermetabolic activity allowed classification as benign incidentaloma, which did not require further invasive procedures. Endocrine imaging: What roles do PET and PET-CT play?. Appl Radiol.